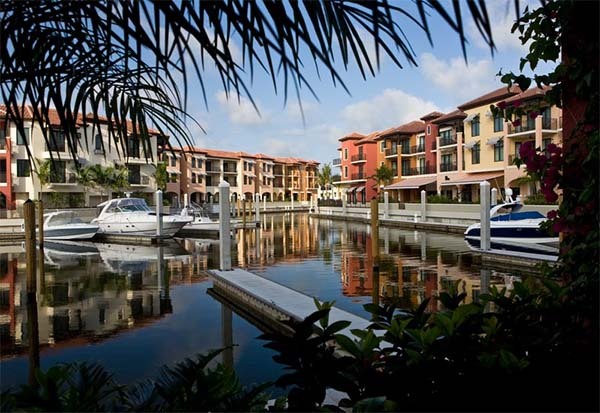 Fifth Avenue in Old Naples is known for its high-end shopping and lively dining, and the new Naples Bay Resort stands deep within the protected waterway of Naples Bay a short drive from the very gateway to Old Naples. The resort comprises two elements: the Hotel at Naples Bay Resort on the water, and the Club at Naples Bay slightly inland, the two parcels connected by a footbridge. The Hotel, its architecture and layout reminiscent of an Italian village, has 65 very spacious suites and 20 rooms alongside a 97-slip marina with a Yacht Club. The Club continues the Tuscan theme in its 15,000-square-foot clubhouse and 100 two- and three-bedroom kitchen-equipped "cottages" (about half available for rent). There are restaurants in both locations, among them the Hotel's waterfront Olio, which showcases regional heirloom ingredients on its Italian menu. 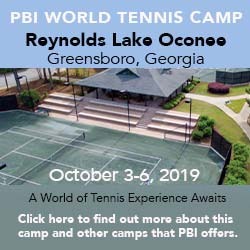 There is also a bayfront swimming pool at the hotel, which the Club adds a vast 5,000-square-foot pool with a walk-through waterfall and lazy river, a separate adults-only pool, a a fitness center, a mini-spa, a Kidz Club, and a tennis complex with six lighted Har-Tru courts. Former ATP touring pro Mark Vines heads up the recreation program. During his career, he reached a ranking of 105 in singles, then turned to coaching following shoulder surgery. His responsibilities include overseeing the resort's family activities, aquatics, spa, fitness facilities, and tennis operations. Together with other staff he offer a weekly roster of clinics, round robins, junior programs, and private lessons. Courts & Fees. There are 6 Har-Tru courts, all with lights. Here's what others have had to say about Naples Bay Resort. "I have to say that the entire facility at Naples Bay Resort keeps us returning several times a year. However, the tennis component gets positive ratings for the willingness of the staff to be aggressive about matching players - singles or doubles. We've had some of the best mixed doubles matches we've ever had from the staff at the tennis center of this resort. With only six courts, they do a phenomenal job of ensuring that we get to play at the times we most desire.